Yesterday afternoon, Sherwood MD senior Solomon Haile (left, John Nepolitan photo) handily won his Maryland 4A West Regional en route to competing in the MPSSAA State Cross Country Championship next Saturday, November 8th. A week ago, without lacing up his spikes or running a single step, he achieved an even more important victory. In a meeting on Friday October 24th (first reported on mocorunning.com), Haile and his sister, Naomi, met with Sherwood High School officials, Coach Dan Reeks and Dr. William Beattie of the Montgomery County Public Schools Athletics Office, in an effort to clear up concerns about Solomon’s amateur status and confirm his eligibility to represent Sherwood for the remainder of his senior year. County and state officials had long been satisfied that lingering questions about Haile’s age were resolved with the birth certificate and Ethiopian school records he’d presented upon first enrolling at Sherwood in the winter of 2007. This meeting was convened to specifically examine whether Haile had received financial gain from road races in which he’d competed before beginning as a junior in the Montgomery County school system. 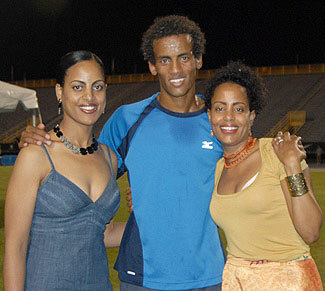 Neither Haile nor his sister Naomi, who entered him in many of the races in question, denies that he received checks and gift certificates for his finishes in competitions prior to enrolling as a high school student, but they have contended that they never cashed the checks or redeemed the gift certificates. At the meeting last Friday, they had an opportunity to present evidence to that effect. Naomi, aware of the controversy surrounding her brother’s status, dug through some boxes which had been unopened since a recent move, and found the now-expired checks. One of the uncashed checks Haile and his sister presented to Dr. Beattie was the runner-up award from the Hartford Half Marathon, a prize which amounted to $350.00 (after $150 was deducted for non-resident taxes). 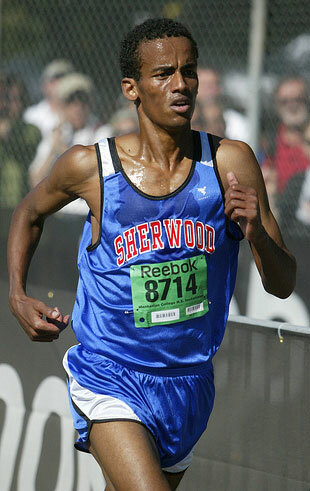 Last week, the race director of the Hartford Half confirmed that a runner named Solomon Semungese (see previous article for an explanation of the name difference and additional background information) had received a check for that amount after finishing second in the October 2007 race. In follow-up correspondence early this week, Jill Hallet at the Hartford Marathon Race Office verified via email that the runner-up check had, in fact, never been cashed. 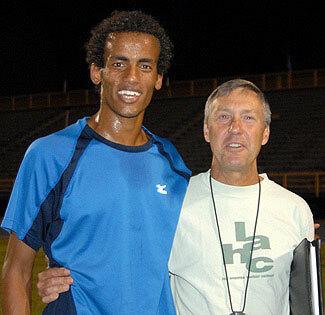 Dr. Beattie, initiator of the meeting last Friday and the man charged with making a decision on the amateur status of the young Ethiopian star, confirms that the check for the Hartford Half Marathon, as well as gift certificates and awards from other races, were presented by Haile and his sister, and were never cashed or redeemed. Early last week, Beattie joined Maryland Public Secondary Schools Athletic Association (MPSSAA) Executive Director Ned Sparks in confirming that questions about Haile’s age had been laid to rest as far as the state of Maryland and the Montgomery County Public Schools were concerned. By the end of the week, Beattie claimed on behalf of both entities that the same could be said of uncertainties regarding Haile’s amateur status. “The state [of Maryland] and Montgomery County Schools are quite confident of his eligibility, age- and amateur status-wise,” Beattie said. That news came as a great relief to Naomi Haile, Coach Reeks, and Solomon himself, who has been deeply troubled by the attention and doubts swirling around him. Even before that Friday meeting was convened, they were confident Solomon would be vindicated in the eyes of state officials. The long-time coach was speaking from the home of Solomon’s oldest sister, Eden, who lives in Silver Spring, Maryland, and serves as Solomon’s legal guardian. Both Coach Reeks and Naomi Haile—who looked after Solomon when he first arrived from Ethiopia, before he began living with Eden in Maryland—used the opportunity to dispel some of the other questions lingering on internet message boards and dogging the talented senior. Why, for instance, did Haile accept the checks and gift certificates in the first place, if he had no intention of using them? Naomi says her brother didn’t feel comfortable turning down the presentations at the post-race award ceremonies, and in most cases—Hartford included—the actual checks were mailed to the address of record on the race entry after the fact. She says she knew from the start that Solomon could not receive prize money if he hoped to compete in high school and, eventually, in college. So they held onto the checks, allowing them to expire without being used. At last week’s hearing, Dr. Beattie asked Solomon a similar question regarding his rationale for accepting the checks. In a discussion he characterized as “very honest and forthcoming,” Solomon indicated it would have been rude not to accept the award when it was offered in the post-race ceremony. He was concerned he might insult the race directors. And then, as Naomi Haile indicated, the actual checks would arrive in the mail and he or his sister would set them aside, knowing that to use them would affect Solomon’s status as a high school athlete when he eventually enrolled. On the question of Solomon’s age, an issue that has plagued Haile even though state and county officials have maintained they are satisfied Solomon is currently 18 years old, Naomi offered her own confusion regarding the birthdates of her eight brothers and sisters as the initial source of a series of mistakes that have followed Solomon into his senior year of high school. When Naomi—already living and working in the United States—began to hear about her younger brother’s enthusiasm for running and his growing passion for the sport, she wanted to provide some opportunities outside of Ethiopia where he could explore his burgeoning talent. She began looking for races held in countries where she had friends or family who could minimize the expense of Solomon’s travel. As a result, she arranged for him to compete in half marathons in Thailand, where Naomi had a college friend, and Austria, where the Haile’s have a cousin in Vienna. In each case, Naomi asserts, the friend or relative took care of Solomon’s expenses and transportation once he arrived, and she covered his air fare. She says Solomon never raced in Italy, contrary to previous reports. There were plans to have him run a race there; the race registration took place, but the trip never materialized. However, from the first international race in which Naomi entered her brother—that half marathon in Thailand—she made an error on his year of birth, an error she says was a combination of the large number of siblings she has and a mistake she made converting the birthday Solomon provided from the Ethiopian calendar to the one commonly used in the United States. Naomi says that error, saddling Haile with a birth year of 1987 instead of 1990, was repeated on the entry for the half marathon in Austria, and again when Haile traveled to the United States to compete in the Hartford Half Marathon. In the case of the US race, the registration was completed on-line with Active.com, creating a member profile in the database which followed Solomon in successive races contested using the same registration company. A check of most of the Virginia and Washington D.C.-area road races Solomon entered in 2007 confirms that they currently use Active.com for race registration. Naomi is dismissive of stories that Solomon lied about his age on the road race entries to avoid requiring a guardian to sign for him. If Solomon answered in the affirmative to questions from reporters about being dishonest on the entries, she suggests, he misunderstood the question due to language difficulties. The final question Naomi Haile and Coach Reeks clarified was the issue of Solomon’s residency. Responding to internet rumors she hadn’t yet heard—that her brother was living, not at her sister Eden’s house in Silver Spring, but with an elite group of Ethiopian runners—Naomi was in disbelief. She then summoned Coach Reeks from a meal he was sharing with other members of the Haile family in that same Maryland home. Knowing, of course, that the concerns related to prize money and financial gain have the greatest potential to tarnish her brother’s reputation, and that the court of public opinion can be far more difficult to sway than a hearing convened by school officials, Naomi was most ardent on the point of her brother’s amateur status. Late last week, Montgomery County and the state of Maryland definitively agreed with that assertion, a decision that will make all the difference for Haile as he heads toward the state meet and national post-season events in the coming months.